Based on your company’s goals and objectives, we recommend which edition of Salesforce is appropriate for your business. Understand your company’s CRM strategic objectives. Create a sales & marketing process map, defining the processes and activities that will run on Salesforce. Define the detailed design for each Salesforce object, starting from a typical template set up, and then identify any automation requirements such as workflow, validation rules and web integration. Define requirements for the security sharing model. Identify the reports and dashboards that your company requires to manage the sales & marketing business processes. Finalize the design and review any uncertainties before embarking on any new configuration or modifying your existing Salesforce configuration. Identify your company’s needs relating to standard fields, custom fields, page layouts, search layouts and validation rules. If your company has vital (customer, opportunity, or product related) data that is not already in Salesforce..and should be, we will migrate your organization’s information into Salesforce. This can include data regarding your prospects (leads, potential customers), contacts, accounts, opportunities (sales, deals, transactions), campaigns (email, trade show, newsletter or phone campaigns), products (SKUs, descriptions, details) or pricing sheets. Typically, organizations need to limit visibility of certain contacts, deals, or other pieces of information to specifically selected individuals within the organization. Establish appropriate data sharing model and rules related to records, areas of functionality and any other data that might reside in Salesforce. Create appropriate custom Profiles and Roles to ensure appropriate data sharing rules are consistently applied. Automation and workflows are key to implementing consistent business process among various members of your organization’s team. In this regard, we create any automation that was agreed as part of the design. This can include workflow rules, custom button creation, validation rules, alerts, tasks or email notifications depending on the design requirements. Analyzing your data, viewing trends and obtaining analytics are critical to ensuring that your company is making progress in achieving the organization’s goals and objectives. We create Salesforce reports and dashboards, tailored to meet your specific business requirements. This can include reports and dashboards displaying your key contacts, accounts, leads, critical opportunities, recent activities, outstanding tasks and campaign status. ﻿As needed, we conduct independent research and evaluation of third party applications within the Salesforce AppExchange to further enhance the your company implementation of Salesforce with additional functionality. In addition, we conduct research to explore external integrations that your company may wish to explore feeding data from external systems in/out of Salesforce. 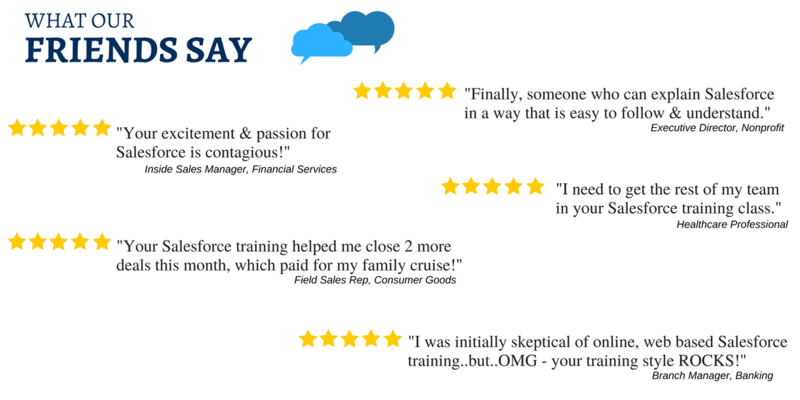 Empowering your team members to leverage Salesforce independently is critical to your business’ ongoing success. Leverage Salesforce mobile and Outlook synchronization, as needed. In addition, we provide training documentation, and/or video recordings for your company’s Salesforce team to utilize Salesforce functionality efficiently and effectively. Where Salesforce has already created the necessary training materials, they will be provided to your company. Where the necessary training materials do not already exist, we create and provide these materials to your company. We provide your company with appropriate and relevant best practices to further support the utilization of Salesforce to automate and streamline your company’s business processes. These best practices will rely upon our experience and knowledge based on Salesforce utilization at many small, mid-sized and large corporations. ..to automate and streamline your company’s business processes.